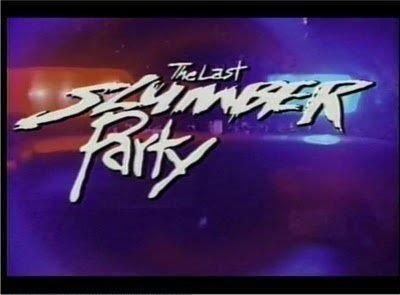 Released in 1988 The Last Slumber Party came out at a time when all that could have been explored with slasher movies were done and while there were still some good slasher flicks the majority at this time was far inferior to those of the early 80s. 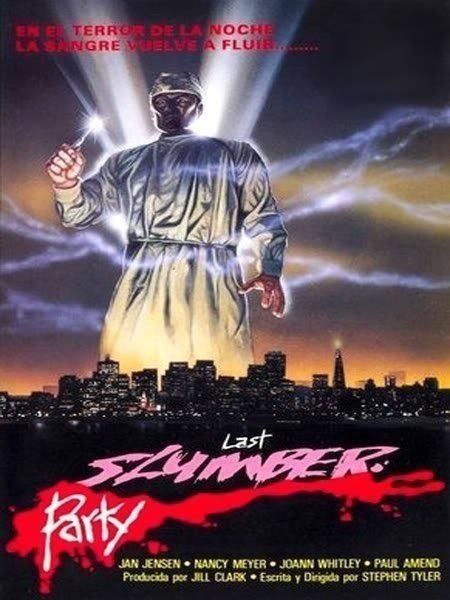 The Last Slumber Party takes a little bit of Halloween and a whole lot of The Slumber Party Massacre and created is one of the most awesomely so bad its good movies of the 80s. From beginning to end The Last Slumber Party is a complete hack job from writer/director Stephen Tyler (no not the singer from Aerosmith, though I don’t think he could fair any worse). To say this was a bad film is putting it very mildly; the acting, writing and directing were all quite poor and I can’t say I’m shocked nobody associated with the film did much of anything afterwards. The editing was horrible and a monkey could have done a better job and the production values were poor, but yet these elements are in part what make the film so much fun. The Last Slumber Party is mostly unknown, but has built up a cult following and it’s really not hard to understand why, but I’d assume most people wouldn’t quite get what’s to love about the film. I have to wonder if Stephen Tyler was trying to make an actual horror flick or was this meant to be some kind of satire? I cannot believe Tyler went into this movie trying to make a legit horror film, but everything is so poorly done its hard to tell if its meant to be serious or some kind of satire or both. The plot if you can call it that has three girls planning a slumber party (and these girls do nothing possibly the most boring party ever), but an escaped mental patient (played by the director) escapes and decides to crash the party. There are some subplots, but they are so poorly executed it’s not really clear what’s going on. The screenplay by Stephen Tyler as I stated takes elements from Halloween and The Slumber Party Massacre and features lifeless characters that are all pretty much inter-changeable with zero depth, but hey were we really expecting anything different? Tyler’s script is filled with amazingly horrible dialogue that while cringe worthy is just simply hysterical and quotable and all the gay slurs by the girls is too idiotic to be even the least bit offensive. I was quite amazed at some of the idiotic dialogue featured here and it’s not at all surprising that Tyler never wrote another movie. The characters have some of the dumbest, but yet unintentional funny things to say and there really isn’t ever a dull moment with the script. With such great dialogue as “he’s such a homo he took the bedspread” and “queerbait isn’t time you came out of the closet”, how can one not love the idiotic writing? Everything about the script feels like it was written by a 14-year old boy. As director Tyler doesn’t fare much better; the pacing can be a bit sluggish, but the idiocy of the movie keeps it entertaining. There is zero suspense and tension and the death scenes are hysterical as everything is so poorly staged and fake looking. Some of the death scenes nearly had me in tears they were so hysterical. If Tyler was attempting suspense it didn’t work very well, but if he was aiming to make the viewer laugh he very much succeeds. I also love the fact how the killer manages to hide in the house and dispatch of everyone and nobody has any clue. It’s not like the house was this huge mansion. It doesn’t really seem like Stephen Tyler has any idea what he’s doing and this does add to the awesomely badness of the movie. There is no structure at all to the Last Slumber Party. The film jumps around so much, which makes things confusing (not in a way that you can’t understand the movie). Some people hail Ed Wood as the worst filmmaker of all time and as much as I like Ed Wood it wasn’t for his filmmaking skills despite how fun his films were, but the scary thing is Ed Wood made better films from a technical side than Stephen Tyler did with Last Slumber Party. Regardless, Stephen Tyler creates a cult classic even if for all the wrong reasons. It seems as if Tyler made things up along the way since many scenes lack any logic and continuity. Only in the horror genre can someone craft such a horrible film, but yet it turns out to be so much fun. I can’t say I’m shocked that Tyler never made another movie after this, but I sort of wish he had. The Last Slumber Party is prime example on how not to make a movie, but yet Tyler still creates a guilty pleasure that even if the movie is horrible I can’t say I hated it and had a lot of fun watching. It sort of amazes me somebody actually funded this movie and it’s not a real shock that it’s so seldom seen, but I can say though that despite how bad this movie was it was a really good time. The acting was quite poor to say the least and when somebody dies it’s simply hysterical due to the poor acting; however my favorite part of the movie is towards the end when Chris (Jensen) accidently stabs her friend and she just gives this no big deal look like she accidently broke a plate or something. 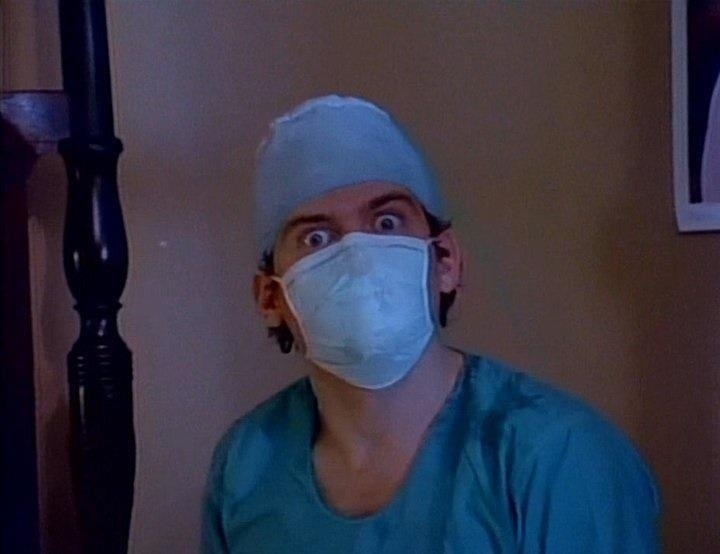 The killer was played by Stephen Tyler and there was nothing in the least bit intimidating about him and even though his face is covered by a surgical mask you can still make out the silly expressions. The performances in The Last Slumber Party are so bad they’re brilliant. Chris just might be the worst final girl to ever appear is a slasher film, but the fact she was so horrible elevates her to one of my favorites. The chris highlights include she’s outside the house and when she tries to reenter the house but a body is blocking the door when Chris enters she sees the body has been stabbed rather than leave the house she closes the door and stays inside and begins to search around the house. She walks around the house ever so calmly even as she finds her friends dead there is no sense of urgency. Is that bad acting or directing? I vote for both. Also she goes into the kitchen and still ever so calmly and looks for a knife. One would think after seeing her friend has been stabbed she would try and leave the house and go for help or when she finds her other friends dead she would get the idea to leave, but nope not our brilliant heroine (which I think she might have been on by the way). Chris remains calm never runs, well if anything she kinda trots at times. I guess she’d rather take her chances with the killer. Another highlight is how the killer sneaks past everyone in ninja like fashion; one scene has him following Chris around the house and the next he somehow manages to get upstairs before her and hide in the closest. I love the scene when the killer enters the house while Linda isn’t looking and as she turns around to go back inside the killer is still in plain view, but amazingly she doesn’t see him. Actually this is very common in the movie as the killer seems to be able to teleport and somehow amazingly go unseen. Either he’s really good or everyone else is just a total idiot. I vote for the latter. However the absolute best scene comes when Chris stabs the killer he grabs his chest and starts to squeeze and then the blood comes out. This movie is so low budget it’s a do it yourself squib. There are bad movies and than there is The Last Slumber Party, which is in a league of its own. But that’s not all there is even more idiocy on display; What’s also funny is the killer easily escapes from the hospital. He’s a crazed killer yet no guards at his door, its also unlocked and nobody has him cuffed either! I also love how Linda’s room is made up of posters of Sesame Street, the Bee Gees, The Beatles and Tom Selleck. Those are some odd choices for posters in a teenage girls room. Overall the Last Slumber Party is one of my all time favorite cult films. The film is absurd with poor production values and amazingly stupid characters. However all this really elevates the film to one of the ultimate so bad it’s good films. Last Slumber Party is easily one of the worst films ever made. Like I said there are bad movies and than there is the Last Slumber Party.